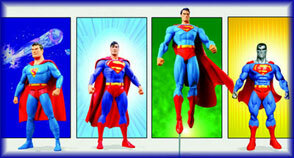 Don\'t miss this amazing action figure gift set featuring the greatest Superman figures! The set consists of four different 6" scale versions of Superman action figures, including Superman For Tomorrow figure and First Appearance Superman. Each figure features a new head and cape, multiple points of articulation and a display base. This set is packaged in a 4 color window box with a full-size 48-page comic book compiling material from ACTION COMICS no1, SUPERMAN (Second Series) no7, and AMAZING WORLD OF SUPERMAN!